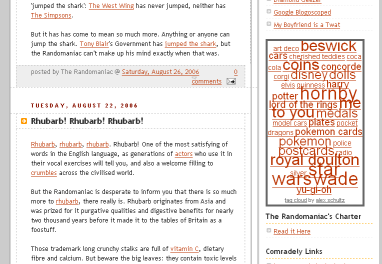 Tag clouds are cool these days and as you can see below can look really awesome in a website. Why don't you get one based on your del.icio.us account, favourite eBay category or even your flickr tags, then put it on your blog. eBay Wish List - Show your favorite searches set in eBay as an eBay wishlist to your friends... you have to add text around it to tell them how to give you the gift... should be cool for Christmas! eBay tag cloud - show most popular searches in a category as a tag cloud. I cache results and recheck eBay once a day. flickr tag cloud - show your flickr tags as a tag cloud linking to those photos. I cache results and recheck flickr once an hour. del.icio.us tag cloud - show your del.icio.us tags as a tag cloud of links.